I’m assuming you’ve never read a entire book in German but you know that reading is a good thing to help with vocabulary building and becoming more familiar with the structure of the language. We are lucky to have a publisher that publishes novels in German that are simplified. The publisher is Spaß am Lesen Verlag (spassamlesenverlag.de). 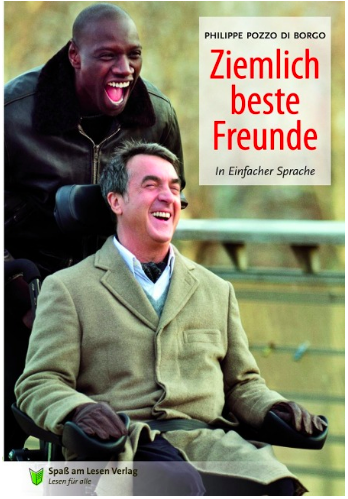 The book I want to introduce is Ziemlich beste Freunde. This is originally a French book that was made into a film a few years ago. Or you can order it from Amazon but make sure you get the simplified version. Mit einem Rucksack fahre ich in die Berge. Ich halte an den schönsten Plätzen. Hunderte Flüge habe ich bereits hinter mir. Gekonnt hebe ich den Gleitschirm hoch. An manchen Stellen drückt der Wind das Gras platt. Daran kann ich erkennen, wann und wo ich am besten losfliegen kann. Ich renne los und hebe ab. Ich kreise. Ich schreie wie ein Adler. Dann zünde ich mir eine Zigarette an. Aus meinem Kopfhörer kommt klassische Musik. Schon oft habe ich laut Opern gesungen, schwebend durch die Luft. Ich bleibe unendlich lange oben. Höher als alle anderen Gleitschirme. Weit über den Bergen. Zwischendurch trinke ich etwas. Ich sauge am Strohhalm, der am Helm befestigt ist. Wenn ich Hunger habe, knabbere ich an einem Schokoriegel. I like this book because it’s entertaining and the chapters are short so even with a short amount of time available to you you can make progress and feel that you have made progress. Another good thing about this book is that it is primarily in the present tense, but where the past tense is used they use the ‘Perfekt’ which is the past form that people use when they speak (unlike the Präteritum, which is the normal written past form). In order to make reading faster and more enjoyable we employ a strategy where we first make mind maps of the verbs and nouns we will encounter in the chapter. This is an active exercise i.e. you look up the verbs you don’t know and fill in the mind map. We use the software Xmind which is available as a free download. 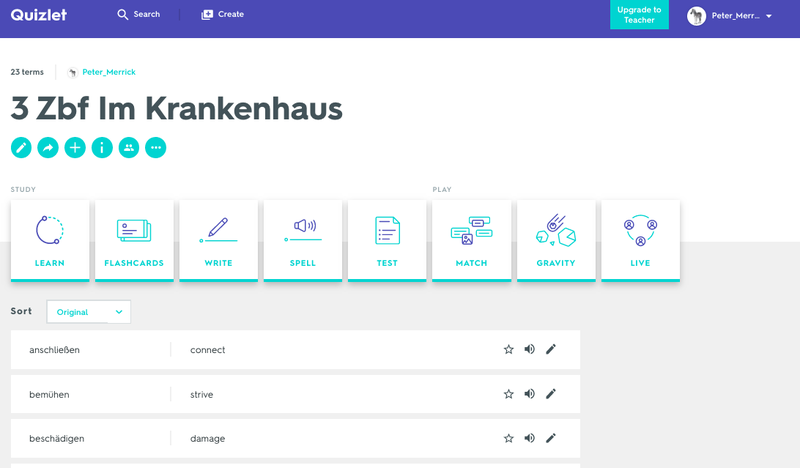 We have also make quizzes for you to test yourself using Quizlet. This means that after a short amount of preparation you can read without having to look very many words up. This makes it more fun. The mind maps are available online. You download them and fill them in. The Quizlets are available online for each chapter. You have to set the quiz up before you do the test. You get plenty of opportunity to learn the vocabulary in Quizlet before you do the test. You can join in this program free of charge and you get access to the mind maps and the quizzes. If you want to join a reading group you can do that too for which a small charge is made. If you’re interested in learning German in person you can check out languagegym.net. Language Gym is an intensive program for learning German that explains the grammar in English, involves reading (obviously), writing (personal narrative) and storytelling (speaking by telling your own stories). All the information you need is on the website. To join the group, write to me at peterjmerrick@gmail.com and I’ll set you up with access to the resources.